LYF has just released Flame 3, the successor of Flame 2, via HS18 online store. Frankly we cannot tag this device as the successor of Flame 2, as it comes with downgraded specifications as compared to Flame 1 and 2. The device is listed for Rs. 3,999 as compared to Rs. 4,799 (Flame 2 Price). As of now, there is only one color to choose from, i.e. Grey. Though the phone has very basic functionality, but it has support for 4G networks, which make it quite unique at such a price tag. Though the phone has not been listed in the official website of LYF, but it is in stock and can be purchased from here. 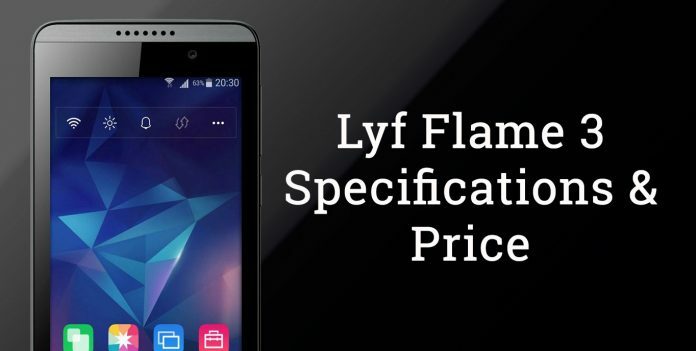 LYF Flame 3 features a small 4 inch TFT display which has a resolution of 800 x 480 pixels. It is a dual SIM phone with 2G and 4G support. The device runs on Android 5.1 Lollipop out of the box with some extra applications. The device is powered by 1.5 GHz Quad Core processor and 512MB of RAM. The internal storage is 4GB but it can be extended up to 32GB via microSD card. It sports a normal 5MP primary camera with HDR mode and a 2MP front facing camera for selfies and video calling. LYF Flame 3 is packed with 1700mAh battery which is user removable and can deliver talk time up to 4.5 hours. The phone comes with 2 years warranty while other box accessories has 6 month warranty. The other features include Wi-Fi, Bluetooth, USB, 3G, 4G and a 3.5mm audio jack. The information is quite limited about the phone, but it has all the basic features that are expected from a budget Android phone. The other alternatives in similar price range are Intex Aqua Speed HD (Rs. 3999), Lenovo A1000 (Rs. 3749), InFocus M260 (Rs. 3949) and Karbonn Aura (Rs. 3777). To get more updates on upcoming LYF smartphones, stay tuned with us.